women levitra When you have as many citrus trees as we do, you’re always thinking of how to use them up! 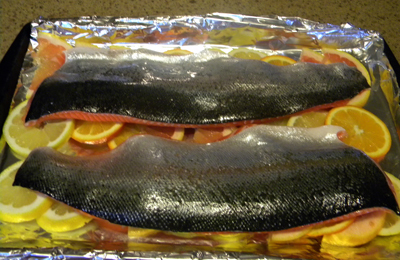 I love citrus and I love salmon, so it’s a joy that they go so well and so beautifully together. I generally buy my salmon fillets at Costco. You can find them both skin on and skin off… and this recipe works for both. If you have skinless salmon, just skip the first cooking step and begin by placing the fillets on a bed of citrus slices, and then immediately cover with the dill stems and another layer of citrus. Cook the same amount of time, it’s as easy as that!